Family members of those onboard the ferry gathered in the port town of Jindo on to pick up those who escaped and await news of those who didn’t. Passengers reported that the disaster began when the ship began listing during breakfast. That was followed by a loud bang. “The internal broadcast advised us to remain in our seats,” a 57-year-old man identified only as Yoo told the semi-official news agency Yonhap. He said he eventually decided to ignore the order and go outside with his life jacket on. “I wonder why they didn’t tell us to evacuate immediately,” he added. Several passengers told South Korean news station YTN that they believed many people had been trapped in the game room and cafeteria, which were located below the main decks. Lim Hyung Min, one of the 325 Danwon High School pupils on the ship, recalled a chaotic scene, with shipping containers knocked off balance and “students falling over and crashing into things and bleeding.” So far, only 75 of the teenagers have been located. 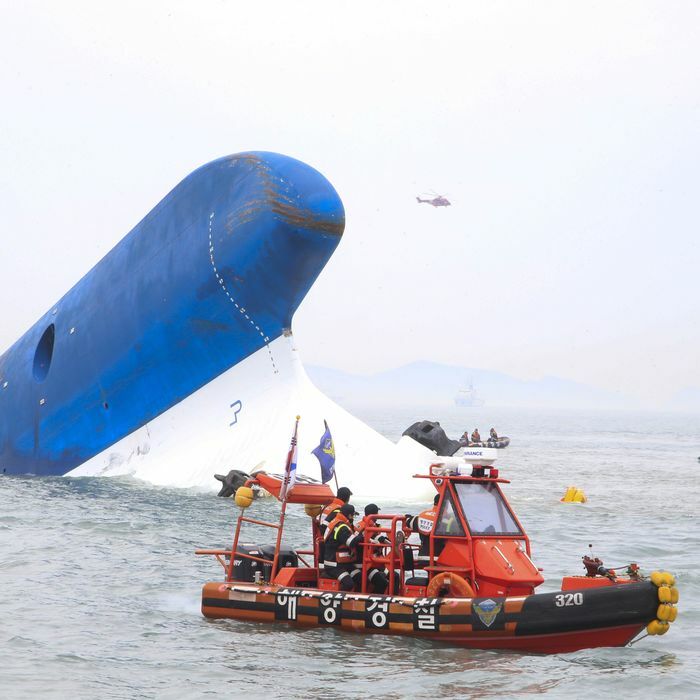 South Korean officials have so far declined to talk about what might have caused the ferry to sink, as they say they are still focused on the rescue operation.